If you're a "techie" who enjoys analyzing data and working in a hands-on environment, whether through software engineering or network analysis, there is a perfect position waiting for you in the exciting field of information technology. 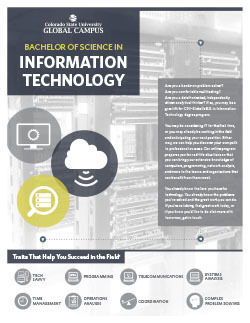 Our Bachelor of Science degree in Information Technology program prepares you for real-life situations so you can actively apply your extensive knowledge of computers, programming, and all IT-related tasks to the professional world. Acquire technical skills in programming and technology trouble-shooting. Recommend, select, and service software/ hardware systems that meet the unique information technology needs of an organization. Work both independently and cooperatively to meet the technology goals of the organization. Comprehend the theoretical and applied uses of information technology in various business applications for problem-solving. You can customize your online degree in information technology by adding a specialization. Similar to a degree concentration, each specialization consists of five upper-division courses (15 credit hours) in a more specific area of interest. A specialization is not required to complete a bachelor’s degree, but it is an ideal way to tailor your educational experience to your professional goals and personal interests. CSU-Global’s accredited online bachelor’s degree in information technology is designed to provide you with a practical knowledge of the IT field. The program consists of 10 three-credit core courses as part of a full 120-credit bachelor’s degree. Maximize your transfer credits and take advantage of our alternative credit options to finish faster and for less! 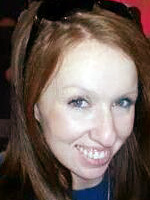 "My experience with CSU-Global has been amazing! From just clicking to get more information, my world was changed. The enrollment counselor walked me through each step to make sure I was making the right choices and decisions, then helped with financial aid options and getting me enrolled in my first courses! I wasn't sure I could go back to school, but with the help of everyone at CSU-Global, my dreams seem attainable now. I would totally recommend this online institution to anyone needing to get their bachelor's or master's!"